Day two of my refight of the Second World War. German First Tank Army attacks the Polish First Tank Army. Forces and battlefield were randomised for Memoir 44 using the game’s dice and a pack of ordinary playing cards. 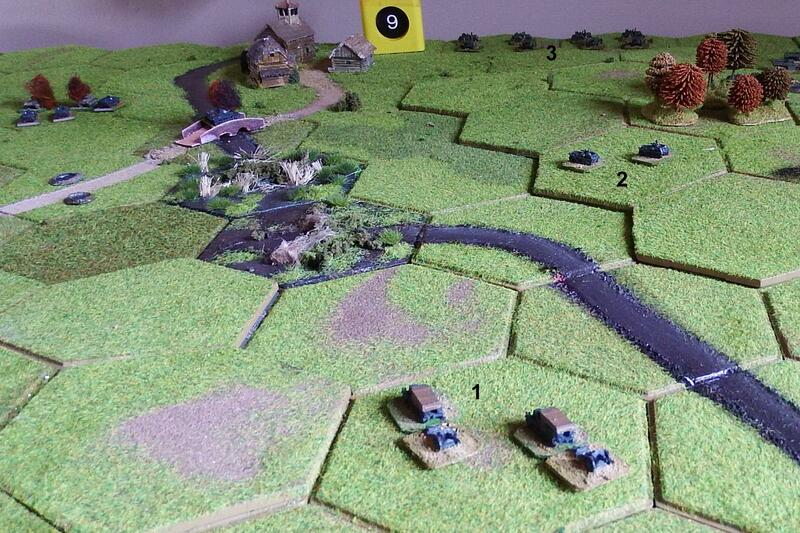 The units were modelled using GHQ miniatures in 1/285 scale and the map board transferred to a table-top using Kallistra hexagon terrain (some of which was remodelled for streams, marshes and roads), buildings from Total Battle Miniatures, and trees and other scenery from a variety of sources. The battlefield with forces deployed. 1 Heavy tank unit of 1 x PzIII. 3 Half-track units of 3 x SdKfz 251 each. 2 Motorised artillery units of 2 x 105mm gun and 2 half-track tractors each. 1 Infantry unit of 4 x 4 riflemen. 1 Supply truck unit of 3 lorries. 1 Horse-drawn artillery unit of 2 x 75mm guns. 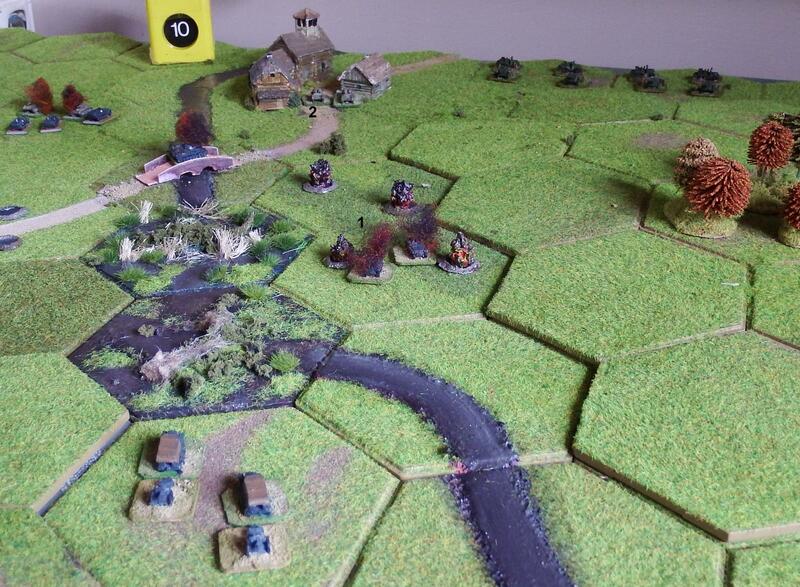 As an aside, I started to play this battle using Rapid Fire rules using centimetres in place of inches, but gave up because I had not modelled observers or HQ units needed for the artillery, so back to my original plan of playing with Memoir 44 rules. To determine the number of command cards for each side I rolled one die per unit and added the number of stars rolled to a base of 3. This gave the Germans 5 cards and the Poles 4. I applied the “Blitz” rules, which give a speed penalty to Polish tanks. – PzIII behaves like a Tiger tank in 1944 scenarios (harder to kill). – Polish tankettes behave like armoured half-tracks without the supply ability. – Polish 7TP tanks with two MG turrets fight as two attacks with infantry MGs. – Polish command cards referring to more than one sector are restricted to one sector, representing the lack of radios. Victory would be achieved by the first player to win 5 medals. Each village occupied counted as one medal, as did the bridge. These were temporary medals, only held while the hexagon was occupied. Thus the Germans started with 1 medal. The German infantry moved out of the village to the railway station (1). From there they opened fire on the Polish tankette unit and destroyed one of them (2). The PzIII moved onto the road (3), supported by a unit of armoured half-tracks (4). 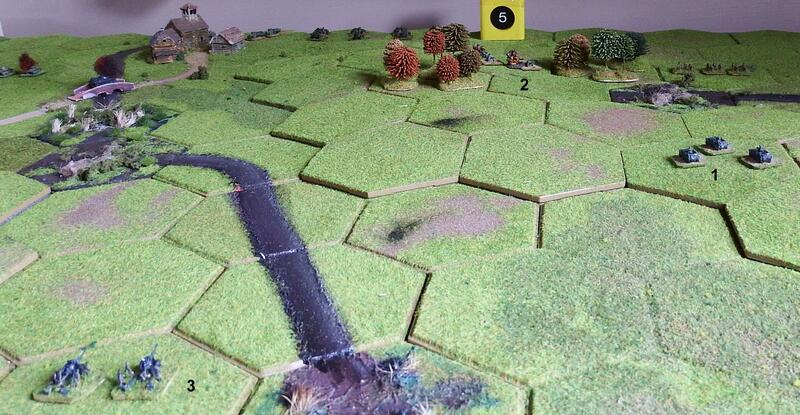 The tank fired at the 7TP unit on the Polish right flank and knocked out one tank (5). The Poles responded by advancing the two 7TP(MG) tanks onto the bridge (6) and shooting at the PzIII, to no effect. One of the 105mm artillery units also fired at the tank (7). It scored a hit, but no damage. One medal was taken for holding the bridge. On the German right flank one unit of half-tracks moved forwards and machine-gunned the infantry defending the line of the stream. One hit was scored. A battery of 105mm guns fired at the 7TP tanks on the bridge. No damage was inflicted but the tanks withdrew from the bridge. The PzIII was also ordered to attack these tanks, and fired as they retreated, driving them further back beyond the village. The Poles lost their medal for holding the bridge, but it was not yet taken by the Germans. On the Polish side the remaining 7TP (37mm) fired at the PzIII but missed. The German infantry moved forwards into the woods (1). The PzIII moved onto the bridge (2) and fired at the remaining 7TP to his left (3). The German artillery started a bombardment. The first battery (1) attacked the Polish light artillery (2) with no effect, but the second battery (3) forced the Polish infantry (4) to fall back. The Polish 75mm guns replied and drove one of the German batteries (5) from the battlefield. One medal to the Poles. In the north – the German left flank – the half-tracks attacked the Polish tankettes (1) but failed to cause any damage. The Polish tank counterattacked and the half-tracks fled back to the village (3), ironically claiming a medal for occupation. The tankettes opened fire on the German infantry in the woods (4) causing casualties. In the centre a unit of half-tracks (1) advanced on the Polish 75mm guns (2), firing their machine guns. The gunners limbered up and retreated, but were caught by artillery fire from the remaining 105mm battery (3) and one team was destroyed. The Germans launched a mass charge of half-tracks across the whole field with machine guns blazing. It had a very limited effect. On the left flank one unit (1) attacked the tankettes (2) once more with no effect except to lose the medal for holding the village. In the centre (3) the Polish artillery battery (4) was eliminated, gaining one medal, and on the right (5) the retreating infantry (6) were targeted with no effect. The Poles replied with both 105mm batteries (7) which hit nothing. The Polish trucks (8) moved across the field towards the infantry to resupply them. The Germans renewed their attacks with the half-tracks. On the left flank (1) they finally eliminated the Polish tankettes (2), claiming another victory medal. On the right (3) the Polish infantry were driven back (out of shot). The Polish artillery batteries (4) shelled the third German half-track unit (5), causing a lot of smoke and flames but no damage. The German supply trucks (1) moved forward to occupy the village and reclaim the medal for holding the village. The infantry moved out of the woods onto the ground previously defended by the Polish tankettes (2) while the half-tracks attacked and eliminated the remaining 7TP tank (3) for another medal. The Polish artillery (4) shelled the German half-tracks in the centre, destroying one (5) and sending the others (6) backwards. The Poles were now in a precarious position. All their units were at the back edge of the board. The Germans needed one more victory medal which they could achieve by destroying a Polish unit, taking the second village or forcing any one unit to retreat. The Germans continued their movement started in turn 9. The Poles on the other hand had far more success, hitting and destroying the German half-tracks (1) and gaining a Victory Medal. They also moved the two MG armed 7TPs (2) into the village for another medal. The Germans unhitched the 105mm guns (1) and selected at extreme range the easiest target – the Polish supply trucks (2), but missed. The Polish infantry advanced towards the woods (3). 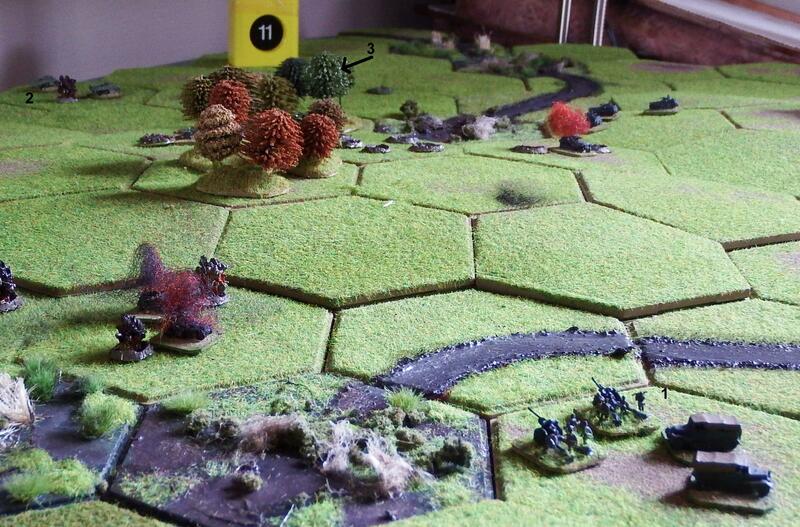 The German infantry continued to move forward on the left flank, entering the woods (1). Their half-tracks (2) retired to a safe distance from the arriving Polish tanks. In the centre the remaining half-tracks (3) advanced between the two woods. The 105mm artillery (4) again missed the Polish trucks (5). The Polish infantry, replenished to full strength, moved into the woods (6) to threaten the half-tracks. All the action was on the German left flank. First the half-tracks (1) moved up to the woods and resupplied the infantry who then moved forwards at to speed towards the village (2). The Polish tanks (3) swung round to attack them, but with no effect. 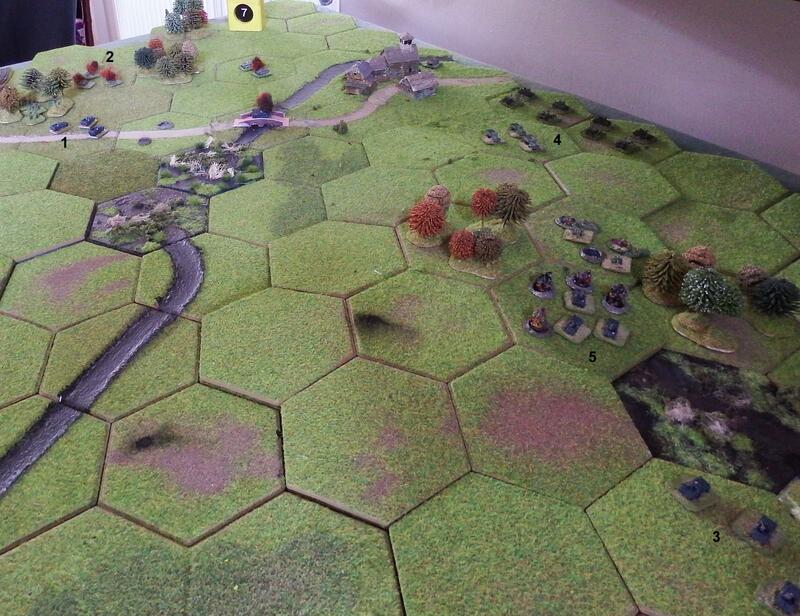 Following their move in turn 13 the German infantry (1) unleashed their firepower at short range against the tanks in the village, causing them to retreat from the battlefield (2). The Germans had won. The battlefield at the end of the game. The remains of Polish First Tank Army retreated east. 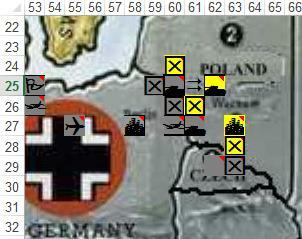 The strategic map at the end of 2nd September looked like this. The next battle will be in the area 6329/6328 between two infantry armies.